For many of us, self-reflection marks the turn of the new year, namely in the form of resolution-making. But few of us ever stop to consider, “What exactly is the ‘self’ I am trying to improve?” A new Yale humanities course, “Selfhood, Race, Class, and Gender” — or simply, the Self Class — is committed to answering the question: What is the “self” anyway? “The idea behind the class,” says Figlerowicz, “is to diversify the axes and dimensions along which people think about what it means to have a ‘self’ and how you express and analyze that self.” As the full course title indicates, among those axes and dimensions for exploration are race, class, and gender. “We look for counter-histories and roads-not-taken,” Figlerowicz adds. The first unit, she notes, is “a rapid-fire history of highlights of philosophical texts in the Western that have thought about the self.” Then follow the units that explore the political axes of self — gender, class, race. In the gender unit, the class compares writings by Shakespeare, feminist French poet Louise Labé, and Persian poets Hafez and Jahan Malek Khatun. “We think about East and West, male and female, the pronouns in these early poems and their fluidity, already shifting between genders,” says Ramachandran. The professors also invite special presenters to come in and speak to the class. For the gender unit in this fall’s class, they hosted Yale students who’d acted in a queer adaptation of Middlemarch that was produced as a web series, which was reviewed in the New Yorker online. The Self Class also tracks the axis of history and the intersecting dimensions of medium, asking such questions as: How does where we are in history determine how we express and analyze ourselves? Does the medium we use for expression and analysis determine the contents of our analyses and expressions? The “self” might be different, for example, when considered on Facebook rather than a diary page, note the professors. One stated goal of the Self Class is to examine “the intersection of political identity and technological categories.” Virtual reality (VR) technology, which Yale obtained initially through a grant from Hewlett Packard, became the bridge between the interrogation of old knowledge and production of new knowledge in the Self Class, say the professors. Figlerowicz and Ramachandran require all students in the Self Class to try out VR and consider the experience in relation to themselves and the texts of self they’ve been reading. The students can, but don’t have to, pursue their final creative projects in the medium. In this past semester’s class, for his project, one student created a high-concept performance art piece involving an anthropomorphic dummy and VR equipment. The dummy was experiencing a VR environment that was projected onto a real wall in the exhibit space so that a person watching the dummy could see what it was seeing. The spectator could move the human-weight dummy about in the exhibition space to affect what the dummy — and thus the spectator too — sees in the virtual space. Another student created a dance-and-video project, which she performed for an audience in November. 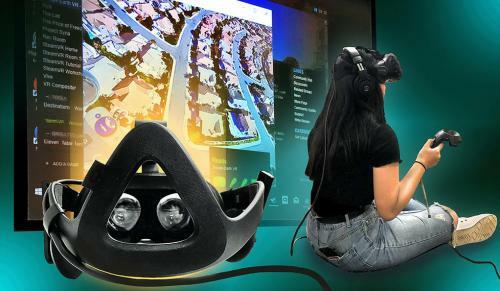 Additionally, several students did projects involving the use of and reflection on Tilt Brush, a virtual reality that allows users to paint in three dimensions. “Selfhood, Race, Class, Gender” was taught twice in 2017. The course is cross-listed between Humanities, English, Literature, and Ethnicity, Race & Migration in recognition of its scope and breadth. This semester, Ramachandran is teaching “Renaissance Love Poetry” and “Gender and Genre in Renaissance Love Poetry,” and Figlerowicz is teaching “Internet Cultures: Histories, Networks, Practices” and “How to Compare,” an exploration of literary comparison. New initiative at Yale seeks to answer the question: What is the internet?